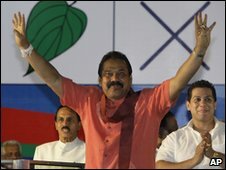 Thirty-seven people are being held in Sri Lanka in connection with an alleged plot to assassinate President Mahinda Rajapaksa, state-owned media say. Most of those detained under emergency regulations are military officers. On Monday, about a dozen officers were sent to compulsory retirement accused of dabbling in politics. The opposition denies there is any plot and says the government has launched a witch hunt after Mr Rajapaksa won the presidential election a week ago. Meanwhile, Sri Lanka's election commissioner has rejected opposition allegations of counting fraud. The scale of the recent arrests came to light after the Daily News, a government mouthpiece, reported that 37 people were in custody for possible involvement in what it called a conspiracy to assassinate the president and several other people. It said those being held included a brigadier, a colonel, army deserters and four civilians. Twenty-three of the suspects had been arrested in a raid on the office of the defeated presidential contender, Gen Sarath Fonseka, the newspaper said. The report said the police were also holding two Tamils, accused of supplying arms said to have been found in a central Colombo temple. An opposition politician, Jayalath Jayawardena, told the BBC the account was false, malicious and fabricated. He said that weapons had been planted in the temple by government supporters and that its chief monk was being harassed for supporting Gen Fonseka. Reports say the monk is among those under arrest. Another pro-government paper says that in addition to the 37 held under the emergency, 20 more people are being questioned. 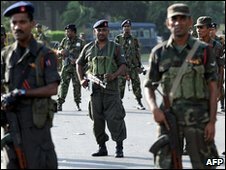 Gen Fonseka and President Rajapaksa were close allies during the defeat of the separatist Tamil Tigers last May, but later fell out. The former army chief has refused to accept his election defeat, saying his supporters were intimidated and the result fixed. He also alleges there is a plot to kill him. On Wednesday, Election Commissioner Dayananda Dissanayake said he stood by the results of the 26 January vote. "I am not satisfied with what has happened in the campaign period," Mr Dissanayake told reporters. "But I stand by the voting process and the results." President Rajapaksa was accused of misusing state-owned media during campaigning - and Mr Dissanayake warned he had no power to ensure similar "abuses" would not recur in parliamentary elections due in March or April. Meanwhile, local media organisations have urged the president to intervene to reduce what they call the threats facing journalists in Sri Lanka today. It is now 10 days since a writer with an outspoken website, Prageeth Eknaligoda, disappeared, and there has been no indication of his whereabouts.